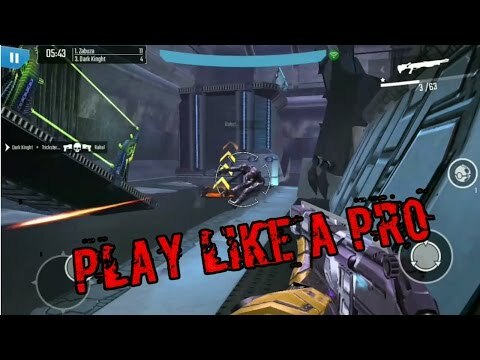 N.O.V.A Legacy is a first-person shooter (FPS) mobile video game which is free and is built for Android devices. This epic action-packed sci-fi belongs to the N.O.V.A. series and was developed by the same company known as Gameloft. Apart from being free, this game is also very light on resources of hardware. It only requires a storage space of just 20 MB in order to download into your devices. Almost all contemporary tablets and smartphones can run this game without issues. At the beginning of the game for new players, they are taken through the game-tutorials that enlighten them on the gameplay. This helps in getting to know how to properly play the game. The player takes Kal Wardin’s role who has a mission to deliver the human race from aliens who are hostile. He wants to do this in style. You should have known basic skills such as weapon-shooting, switching weapons, using grenades, and making use of field equipment. The player looks through for goodies in the ship as the game starts out. At the same time, you should look out for enemies. You can shoot at the enemy by making use of sights. The enemies also fight back and know how to evade the player’s shots as well. Both the enemy and the player use the element of shoot and cover. To deal with the enemy waves, there are decisions to make, codes to collect and make use of strategic decisions to deal with certain cases. Upon the completion of a level, the player can make use of the goodies that have been collected. The game also features an element of crafting. The part that makes the game even more enjoyable is the multiplayer feature. All through, the main character; Kal Wardi’s who is the player; is strong, he still gets assistance from his personal agent called Yelena. Together they fight against the aliens and try to unveil the reason as to why there had been an attack on the planet. There is a multiplayer battlefield that you can take part in. You aim to avoid getting caught up in the cross-fire and be the last standing shooter. There are special skins and 3D models to customize your character. As you take part in a 4 by 4 multiplayer strike, ensure you don’t get on the path of shots and get hit. You can upgrade your cores on the suit to get more bonuses. The upgrade helps in boosting the strength of the player and the accuracy of the sniper. For matches that are multiplayer and privately organized. The advanced system for match-making can be found online. N.O.V.A. Legacy is a free-to-play game that you must play if you loved the others in the N.O.V.A. series. It is a game that is really easy for most of the gamers and yet is still a great experience. Therefore, for the basic features, just download it for free into your phone.